Now, spending £179 on champagne might raise a few eyebrows. But a champagne-coloured watch? We're okay with that. 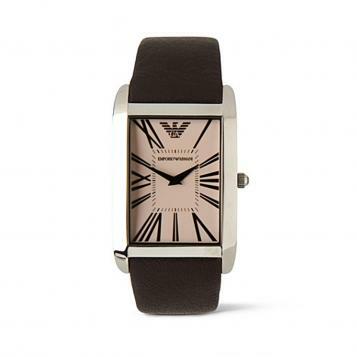 This Emporio Armani timepiece comes in a stylish champagne colour, a shade you don't really hear being banded about that much. The face is a peachy golden hue with a soft leather strap in brown. It would look perfect with a sharp grey suit. Rectangular watches can often look a bit disproportionate, but this one is sleek and stylish, with the Roman Numerals giving it a bit of a twist. And less than £200 for a designer watch? We'll toast to that.